As the federal wire fraud trial against James Gatto, Merl Code, and Christian Dawkins continues, with each new day bringing some new detail about the apparently widespread payment to young basketball players by companies like Adidas and agents looking to direct them to specific schools, it’s getting clearer and clearer that the “amateurism” system that the NCAA is so proud of and eager to defend is a complete sham. You’d need to have had your head stuck in the sand for at least the past 12 months to see college basketball as anything other than completely broken when the best option for players to earn what they’re worth is to receive under-the-table payments from wannabe power players trying to buy clout. 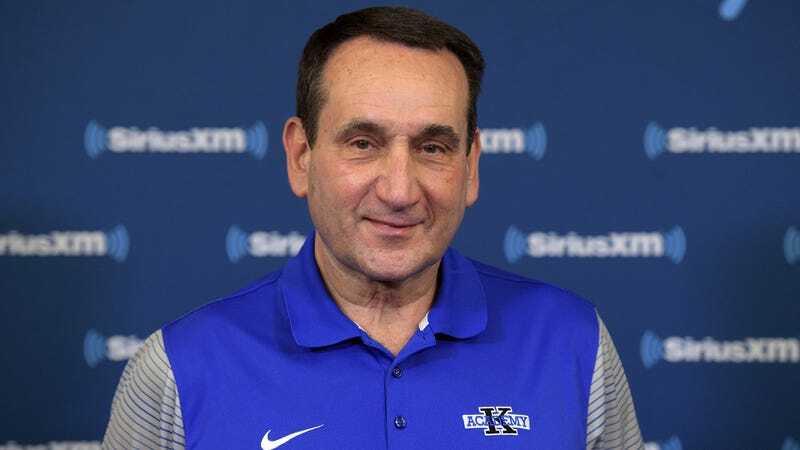 However, if you were looking for a person to shrug, distance himself from the situation, and pretend like he has no power over the larger college basketball landscape and say that it’s perfectly functional anyway, you unsurprisingly found one in Duke head coach Mike Krzyzewski, who downplayed the corruption trial today. Here is a rough list of every player who has been implicated in some way with payments that violated the NCAA rules on amateurism: Auburn’s Austin Wiley and Danjel Purifoy, Louisville’s Brian Bowen, USC’s De’Anthony Melton, Bennie Boatwright and Chimezie Metu, Arizona’s Deandre Ayton, NC State’s Dennis Smith Jr., Seton Hall’s Isaiah Whitehead, LSU’s Tim Quarterman, Maryland’s Diamond Stone, Kentucky’s Bam Adebayo, Washington’s Markelle Fultz, Utah’s Kyle Kuzma, Xavier’s Edmond Sumner, Kansas’s Josh Jackson, Billy Preston, and Silvio De Sousa, Texas’s Eric Davis Jr., San Diego State’s Malik Pope, Clemson’s Jaron Blossomgame, Wichita State’s Fred VanVleet, South Carolina’s P.J. Dozier, and Michigan State’s Miles Bridges. That list doesn’t include players like Alabama’s Collin Sexton, or—most notably here—Duke’s Wendell Carter, who had meals with former agent Christian Dawkins but weren’t connected to receiving any actual benefits. It also excludes schools like Miami and Oklahoma State, who haven’t had players directly named, but have had coaches accused of taking bribes and being otherwise complicit in the payments. It’s fine that all of these guys and/or their families got paid! If anything, they should have gotten more than the few thousand that each is generally said to have received—in a case like Miles Bridges’s, the violation was so trivial that not even the NCAA could muster an actual punishment. But the good thing about this ongoing wire fraud trial is that it’s taking the mundane underground payment of top college basketball players and bringing it into the light, so that it’s undeniable that major apparel companies, college coaches, and unscrupulous agents all have a clear system for making bank off these teenagers’ talents. The more this money is out in the open, the harder it’ll be for the NCAA and its enablers to keep it from the kids who’ve actually earned it. Denying that any of these payments even happen all that often, like Coach K is doing, pretty obviously just works to maintain a deeply flawed status quo.